I believe that this is the one published as Hoya obscurinervia, which is generally thought to be a variety of Hoya pottsii. Hoya baishaensis X.Y. Zhuang, P. T. Li, J.Y. Lin & M. Li, in Annales Botanici Fennici 6(2): 155-158; (fig 2) (2009). I haven’t yet been able to obtain a copy of this publication so I can’t even hint at how it looks. Hoya benitotanii Kloppenb. in Gardeners’ Bulletin Singapore 61 (2): 330-332 (2010). This Philippine native was described as being similar to Hoya gigantangensis. Hoya danumensis Rodda & Nyhuus in Asklepios 106:13-18 (2009). I haven’t yet obtained a copy of this publication either but it is my understanding that it is similar to Hoya wallichii. Hoya persicinicoronaria S. Y. He & P. T. Li in Novon 19(4): 475-478 (2009). The authors said it is closest to Hoya pottsii and Hoya liangii and turns right around and says that “it differs from them in its indumentum, leaf arrangement, leaf pattern, leaf shape, apex and size, calyx shape and corolla colour.” In other words, it is nothing at all like them. This publication is well illustrated. It’s foliage in the illustration looks most like that of Hoya balansae but differs in being several times larger and it lacks the long internodes. The illustration shows the leaf arrangement to be much like that of Hoya mitrata, i. e., many leaves crowded together at a lot like a loose leafed cabbage. Flowers don’t appear at all like those of Hoya balansae or Hoya mitrata. They are as different from those of Hoya liangii and Hoya pottsii as night is from day . & white Xerox copy of the name publication, so I can’t be at all sure but the little I see makes me think it is the same species as one I used to grow labeled F-484. I’ll need to go back through 14 file cabinet drawers and look at hundreds of publications to be sure but I vaguely recall that this hoya was identified a long time ago. The source of F-484 was Jules Marnier Lapostolle, a Frenchman (co-owner, with his brother, of the firm that makes Grand Marnier Liquors). If any of you still have a hoya labeled F-484, I’d love to buy a cutting or get flowers to compare with this. Meantime, I’ll keep my eyes open when going through my files and see if I can find what it was identified as (if it was). In the publications Hoya benitotanii and Hoya yapianum cited above, Mr. Kloppenburg gave us proof positive that he doesn’t know the meaning of the word, “pinnate.” He said the leaf veins are pinnate, with the main veins extending from the base to near the apex. Friends, pinnate veins extend from the costa outward, toward the leaf’s side margins. They do not extend from the leaf base to near the leaf apex. QUESTION: What am I doing wrong? I keep buying those beautiful EA Hoya plants from Lowes and Home Depot but they soon die. Help! – Several readers, including a couple of my cousins (I was surprised to know that they were hoya lovers). ANSWER: I’ve had bad luck with them too and I think I know the reason. Engelmann is not just a grower; he is a salesman. He wants you to look at that gorgeous basket and have it make you “drool!” To do that, he plants many cuttings in that small pot. Each cutting becomes a plant. A pot full of small plants, soon becomes a pot full of large plants, competing for both space and nutrients, and for air. His nursery is state of the art so he can create just the right atmosphere to get optimum growth in a short period of time Over crowding doesn’t cause too many problems at first, which is why those plants look so good when you see them in the store. By the time overcrowding becomes a problem, his money is in the bank and it is not his problem; it’s yours. These plants suffer more from lack of air circulation than anything else. This overcrowding also gives mealy bugs plenty of places to hide until they become a major problem. I believe that if you remove half (or more) of the plants, as soon as you take an EA basket home from the store, that the plants left in that pot will stand a very much better chance of surviving and thriving. Then, as the remaining foliage grows larger, prune entire branches out every spring. You’ll hardly miss those branches. Just think of all the new plants you can make with the plants and branches of plants you have when your thinning job is done. You’ll have material to trade, to sell, and to use as gifts. Alma Parker, an avid hoya grower of the 1970s, had the most phenomenal luck in getting hoyas to bloom of any grower I ever encountered. She wrote that she found that all species bloomed sooner, for her, when only one cutting was planted in a pot. I don’t go that far but, I don’t knock what I haven’t tried. QUESTION 2: What causes fungus and how do you cure it? ANSWER 2: I can’t give you a scientific answer but one based on observation and experience. I think our hoyas get fungus disease due to poor air circulation. Most of the EA hoyas that I have lost have been lost due to fungus infections that started on the hidden parts of the plants that were crowded into the baskets, where my eyes didn’t reach until it spread to low hanging branches. I tried several different fungicide sprays found in local nurseries but they didn’t work at all well. I finally called on a long time gardening friend and asked her what worked. She said, “When all else fails, I give my plants a bath in white distilled vinegar. She advised that I dip a sponge in the vinegar and then gently rub each leaf and branch where I saw signs of fungus. I tried it and it worked. The owner of this business should have been acquainted with my Garden Writer’s of America friend, Virginia Beaty. We were on a tour bus of the NY-Bronx-Long Island area, at our annual meeting. It was 1977 or 1978 (don’t recall exactly when). Someone asked me if I would recognize Hoya carnosa if I saw one. I replied that I would as I mimicked the old time singer, Gracie Field, by singing her song about the “Biggest Aspidistra in the World,” substituting “the Biggest Hoya carnosa in the World.” My Hoya carnosa filled a 36 gallon container and bloomed from March through October every year. I couldn’t count the number of umbels as there were so many. Trying to reminded me of the old Hoagy Charmichael novelty song from the 1940s. “Huggin’ and Chalkin’.” In trying to count the number of flower umbels, I marked my starting point with a clip-on clothes pin. Then I’d circle the plant and count as I went. I kept clipping on clothes pins to mark where I’d already counted, just as the fellow in the song made chalk marks to mark what parts of his overly endowed lady love he’d embraced. I lost count and started over a dozen times before giving up. When I said I had the biggest Hoya carnosa in the world, Virginia Beaty, who was then a staff writer for the very popular house plant magazine, Plants Alive, spoke up. She said, “Chris, don’t ever tell anyone that you have the biggest, best, most or only one of anything.” If you do, they’ll think you are naïve or just exaggerating and sure as shootin’, someone will appear out of the woodwork and make a liar out of you. Tell them that you have what may be the second largest and they’ll think you are just being modest.” I found that to be good advice. The proprietor of SRQ’ Catalog opens with what I believe to be a false statement, “Welcome to the largest collection of available hoyas in the country.” There, on the same page, is a place that you click on to see this seller’s Hoya List. Apparently, this is a list of all the hoyas in her private collection. Even if all of those were available, she’d not have the largest collection of available hoyas in the country. You have to click on another place to find the hoyas that the seller claims to be “Ready to Buy.” In my opinion, if they aren’t ready to buy, they aren’t available. Well, what do you know? I made a count of the so-labeled “Ready to Buy” hoyas. On the day that I made that count, I came up with 155 names (fewer different species as the seller listed a few identical things as two different species). Out of 155 names, there are 76 names on that “Ready to Buy” list that are NOT “Ready to Buy.” 3 are listed as “Out of Stock.” 55 are listed as “Sold Out,” or “Sold.” 7 are listed as “Coming Soon,” 5 are listed as “Not available.” 6 are listed as “One Left.” I interpret “One Left” as meaning that by the time I read the list it will already be sold. I interpret “Coming Soon” as not yet ready to buy and may not be ready when my order arrives. Sold Out, Out, Out of Stock, Coming Soon and One Left are not available and should not be counted to make up a list of “available plants.” But hey, no one ever orders just one plant so the seller has still made a sale even if 90% of the customer’s order isn’t available as advertised.. It’s called salesmanship by some; false advertising by others. To me, a potential customer, this is no different than merchants who advertise goodies to get you in the store. When you get there, they fill the aisles with cheap twofers in order to get rid of slow sellers. Just try and find what you came in for – it often can’t be done! To me (and everyone I asked to define it), “available” means exactly that, available right now, not sometime soon; not sold out and certainly never “not available.” He’s no friend of mine but Ted Green’s list is a lot longer and, although his business is to sell cuttings, he will root them for you for a buck or two more and about an 8 week wait, at least he used to. That says to me that he has more available hoyas in the US in the form of both cuttings and plants. I’d buy from him if he’d sell to me, but he won’t. Also, not friends of mine (I really don’t know them), but I am 100% sure that there are at least two sellers in the Carolinas with more available hoyas than SRQ has. I could go on and name others who have more but the others I know only sell to walk in trade. They mail only to special friends. Speaking of fine print. The pictures in this catalog are so small that proving them to be correctly labeled or mislabeled is hard to do but I’m sure that I some of them are mislabeled. First off, I wouldn’t attempt to even try to straighten out the mess that is listed as Hoya acuta. I believe that van Donkelaar, Dr. Veldkamp and others who sunk Hoya acuta into Hoya verticillata were correct to do so. I do not believe that most of the things Kloppenburg has identified and sold as Hoya acuta belong there. I believe that this seller (and most others) have accepted his labeling as correct and followed suit. For example, the ones circulating on many lists as “Spearmint” and “Malaysian Green” (or just plain green) are, in my opinion, varieties of Hoya pottsii. I do like that green one but most of the group I could do without. I believe some of this seller’s hoyas are nothing more than these mislabeled Hoya pottsiis, posing as acutas. Second, I will not comment on most of the Eriostemmas, except to say that I recognize them as true hoyas. Even their strange looking pollinaria are more like other hoya pollinaria than they look to be. Their pollinaria and the pollinaria of all other hoyas have corresponding parts, even if the shapes of the caudicles and translators differ. Perhaps Schlechter was correct in suggesting that the Eriostemmas might be considered to be a “subgenus.” The last I read about the Eriostemmas was in a Flora Malesiana Bulletin shortly after those Hawaiians published their move from Hoya to Eriostemma. What it said was that their publication was invalid. 2). On personal list, not the “Ready to Buy” list. Hoya aff. albiflora. I could be wrong but that surely looks like Hoya magnifica to me. 3). Also on personal list, not the “Ready to Buy” list. I see here a Hoya Archboldiana ‘Jumbo Red.’ I’d have liked to see the hybridizer’s name attached. Is this a published cultivar or just a frivolous name that someone thought up to distinguish it from the white and pink clones? Due to Ted Green’s attaching the frivolous title of ‘YM-Excellent’ to the giant red one, in a manner that is supposed to indicate a cultivar, people appear to think it is a cultivar. Friends, that big red Hoya archboldiana IS the only one of those “Archies” that exactly matches C. Norman’s holotype specimen. It IS Hoya archboldiana var. archboldiana. The YM-Excellent does not belong there. I doubt that “Jumbo Red” belongs there, but I could be wrong about that. What the YM-Excellent means is that Ted Green bought it from an Australian collector, whose name was (maybe still is) York Meredith. 4). Hoya australis subsp. tenuipes was written as Hoya australis ssp. Tenuipes. Species and subspecies names should not be upper cased. Cultivar names should be upper cased. This is not a cultivar. 5). The current status of the one circulating as Hoya buotii is that it is Hoya halconensis Schltr. ex. Kloppenb. I think that both of those names may soon be sunk. Keep tuned. 7). The one labeled Hoya campanulata doesn’t look much like it to me. I could be wrong. The tiny picture shows no identifying detail. 8). This dealer says that Hoya camphorifolia is not a climber. I wish someone would tell my Hoya camphorifolia that it’s not supposed to climb. That sucker reaches out and touches anything and everything around and about it. It then twines and climbs vigorously, to the point of being a pest. It reminds me of one of our native members of the morning glory family, known in these parts as “bind weed.” It drives our farmers mad. We are all grateful that it isn’t on the endangered species list. It is classed here as a noxious weed. I’ve about decided that Hoya camphorifolia is also a noxious weed. So what does this lady have? It looks like it could be Hoya camphorifolia to me. I suspect the lady hasn’t been growing it very long and doesn’t really know its nature. 9). Hoya aff. cardiophylla. To me, this seller’s picture looks like another acuta/verticillata etc. clone but the picture just isn’t good enough, nor large enough, to be sure of anything. I know one thing and that is that the plant other people sell as Hoya cardiophylla and as Hoya aff. cardiophylla is NOT Hoya cardiophylla. 10). One thing I’m 100% sure of and that is that the one this lady pictured and labeled Hoya chlorantha is NOT that species. I’d need actual flowers to be 100% sure but I believe that what she has is Hoya betchei --- and don’t try telling me that Hoya betchei is a synonym of Hoya chlorantha. It is not. To see how these two species differ see The Hoyan 4(1): Cover (1982) and 8(4): 61-63 (1982). 11). I am likewise, 100% sure that the hoya pictured as Hoya chuniana is not that species. 12). The one pictured as Hoya citrina does not fit Ridley’s description. It may be a variety of it. I don’t know. 13). Listed is a hoya labeled Hoya compacta variegated. This picture, which shows what is probably a large basket of whatever it is, is so small that the variegation on the leaves can’t be seen. It is so small that one can’t even see the contorted leaves. It’s all just a blur. The sad part is that the variegated compactas have names. They are cultivars. If the variegation is “green leaves/white borders,” then what it is, is Hoya compacta cv. Regalis. If the variegation is “green leaf borders/ white, cream and/or yellow in the center, what it is, is Hoya compacta cv. Mauna Loa. The latter also was cursed with a “Trademark name,” which is cv. Lura Lei. 14). Regardless of what I (and most people) thought in years past, Hoya densifolia is not a synonym for Hoya cumingiana, however, the one that has been sold by Green and company as Hoya densifolia is NOT Hoya densifolia. It is Hoya cumingiana. Hoya cumingiana is a Philippine native. It is a lot more attractive than Hoya densifolia. Hoya densifolia is a native of Java, Indonesia. Plant wise, the two are very similar but the flowers are extremely different. Hoya densifolia’s are somewhat smaller. It is the flower’s corona that is so different, that and its pollinarium. See picture. The picture was given to me by David Liddle. He gave me permission to use it. 15). Cultivar Iris Marie is not, in my opinion, Hoya cembra X Hoya schneei. It is Hoya cembra X, one of the two different species circulated as Hoya schneei in the late 1980s and early 1990s. One was collected by Ted Green (or whomever sold it to him) and the other was collected by Dale Kloppenburg. The two are not the same species. One of them is most likely Hoya schneei and the other is, most definitely, Hoya trukensis. The flowers and the foliage of the plant, Hoya cv. Iris Marie have features that are found on the holotype of Hoya trukensis that are not found on Hoya schneei. Many of the names in this catalog appear to be the names given them by David Liddle at one time or another. It is a crying shame that this lady (or her source) did not retain the IML-numbers that must have been on them when she (or her source) got them, so that she and her customers would have an easier way of keeping track of what is learned about these species almost daily. David Liddle’s labeling was more accurate than most but he did make mistakes, just as all humans do. Proof can be found in his catalogs as he changed the names associated with IML numbers several times in the last three or four years. Those who fail to retain those numbers have no way of keeping track of the current status of any of his plants. I have never bought anything from nor exchanged anything with SRQ so I cannot testify to the quality of its plants or its service. I have not heard from anyone else who has purchased from this source. The only thing I know about this grower came from reading the on line catalog and her letters (and those of her “know not” mentor) on DG, unfairly vilifying David Liddle last year. I wasn’t favorably impressed. 1). Hoya cinnamomifolia is illustrated with a picture of something entirely different. The picture is too small to be100% sure what it is. It looks like Hoya benguetensis. 2). I believe that the several pictures labeled Hoya finlaysonii belong to a single species but that species isn’t Hoya finlaysonii. I’m 100% sure of that. Hoya finlaysonii foliage is rather plain. The foliage pictured is much too decorative to be that species. 3). The foliage of Hoya meliflua and the one called Hoya meliflua var. fraterna are pictured along with a picture of the true Hoya fraterna flowers. The text misidentifies Hoya meliflua as a “subspecies” of Hoya fraterna and they added the false statement saying that Hoya fraterna is a native of Australia. 4). They list a Hoya gonoloboides and I KNOW that they know better (or did know better once upon a time). I don’t know what they’re selling as this one. The plant picture looks like the clone of Hoya diversifolia that Loyce Andrews and van Donkelaar sold to me as Hoya gonoloboides back in 1975 but the description given here of the plant’s having “straw yellow” flowers, tells me that it is something else. Again, fellows, Hoya gonoloboides IS NOT a hoya. It does not have glabrous green leaves. It has huge, very thin leaves that are completely covered with stiff, bristly red hairs. In fact, all parts of the plant are covered with stiff bristly red hairs. 5, 6 & 7). Three different clones of Hoya kerrii are featured here (plain, hairy and variegata). Each one is accompanied by a picture (same picture for each) of an umbel of Hoya cinnamomifolia flowers. 8). Hoya australis subsp. australis listed as Hoya keysii. 10. Hoya vitellinoides listed as Hoya meredithii. 11). Hoya cv. Iris Marie listed as Hoya paziae. 12). Hoya nummularioides is mislabeled as Hoya pubera. 13. Can’t be sure of which it is as not enough of the plant showed in the picture but the flowers belonged to either Hoya pachyclada or Hoya subquintuplinervis. 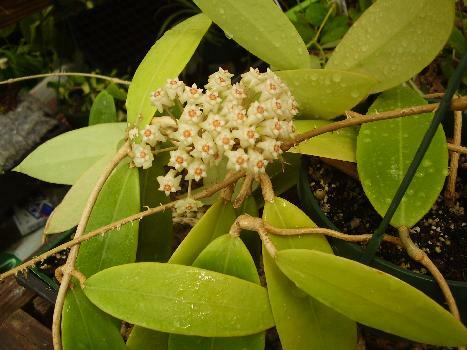 It is mislabeled as Hoya rigida. 14 & 15). Hoya brevialata is mislabeled as Hoya sulawesii and the text says that it is a native of South China. Fact: Hoya brevialata is native to Sulawesi and Sulawesi is not even in the same hemisphere with South China, which is in the northern hemisphere. Sulawesi is thousands of miles to the south, in the southern hemisphere. 16). DS-70 was determined, at least 5 years ago to NOT be Hoya tsangii, but Tom and Ken, obviously never got the message. The owners of this nursery were, once upon a time, the most knowledgeable and up to the minute (even up to the split second) about what’s what concerning Hoya nomenclature and Hoya taxonomy. I guess something happened along the way because their catalog tells me things are not like they used to be.